The Motorola Xoom is currently the only major Android tablet on the market which runs Android 3.0 Honeycomb. All the other Android tablets are either mediocre, or run Android 2.2 Froyo, which isn’t meant for tablets. 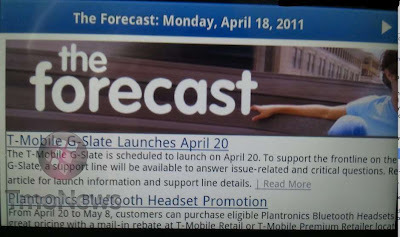 LG had announced the T-Mobile G-Slate at CES 2011, but it had just dropped off the radar after the initial announcement. It was spotted again at CTIA 2011, where we had done a quick hands-on of the Android tablet. Today, TMONews has confirmed the official launch date for the T-Mobile G-Slate. The G-Slate will be launching on April 20, with the T-Mobile G2X and the Sidekick 4G. The LG T-Mobile G-Slate comes with an 8.9 inch display with a 1 GHz dual core processor and 1 GB RAM. It is powered by the Nvidia Tegra 2 platform and comes with dual 5 MP cameras at the back for 3D video capture, and a 2 MP camera in the front for video calls. It offers 32 GB internal storage and is expected to be priced starting at $529.99. It offers Bluetooth, Wi-Fi and 4G connectivity and comes with Android 3.0 Honeycomb.